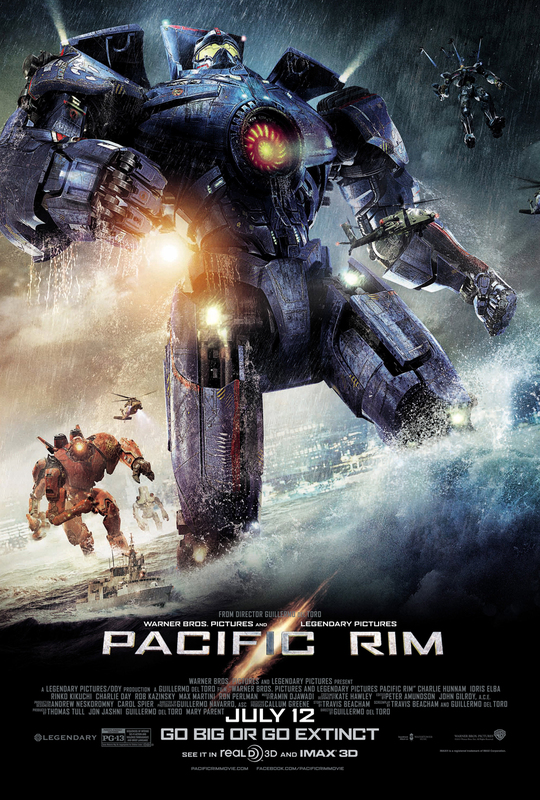 Pacific Rim (2013) | 'TAIN'T THE MEAT… IT'S THE HUMANITY! At the beginning of the year Summer 2013 promised to be a great one for fans of big-budget, large spectacle action movies. With the promise of three sequels, a re-make of an old TV classic plus the reinvention of a beloved superhero (that promised to be most anticipated film of the year), it looked like I was going to be spoilt for choice to pick a favourite. Alas, things didn’t work out that way. First out of the gate was Iron Man 3 and although it was fun to watch Robert Downey, Jr reprise his role as the eponymous superhero the film failed to capitalise on the character’s growth from last summers Avengers movie, and it’s lavish action set pieces couldn’t mask the film’s thin plot. Next came Star Trek Into Darkness which, after the successful relaunch of the franchise two years ago, inexplicably wasted the second film with an unnecessary remake of Star Trek 2: The Wraith Of Khan that didn’t come close to matching the fun or excitement of the original. June saw the release of this summers most eagerly awaited movie, Man of Steel, which featured some of Hollywood’s A-list creatives – Batman director Christopher Nolan acted as producer, while Batman Begins writer David Goyer scripted and 300 directer Zack Snyder helmed. The film garnered both praise and anger from fans, some lauded it for successfully bringing Superman into the 21st century while others criticised the violence and high level of collateral damage. Personally, I thought it was depressing how badly it missed the point of the character and the film has none of the wit or sense of wonder that the original 1978 version achieved so effortlessly. Next came World War Z, a film with a long and troubled production; I really didn’t hold out much hope for this movie but it isn’t half bad. The large set pieces work well but the film is ham-strung by the inexplicable decision to make it a (literally) bloodless 13 certificate. A zombie movie without gore begs the question, why? Then we had The Lone Ranger, the long gestating and budget troubled re-imaging of the classic character created by the core team from the massively successful Pirates of the Caribbean franchise: director Gore Verbinski; producer Jerry Bruckheimer and star Johnny Depp. Unfortunately the film couldn’t make it its mind what it wanted to be – equal parts revenge Western, off-beat comedy and buddy-buddy film it tries to be too many things at once and ends up a damp squib. Lastly, The Wolverine has yet to open but bearing in mind how crappy the first film was I’m not holding my breath. With all this disappointment I really didn’t hold out much hope for Guillermo del Toro’s giant robots vs monsters film Pacific Rim. Sure it sounded cool in theory but by mid-July, after having my hopes dashed by the summer’s other big-screen efforts, I was sceptical. Also the last few years haven’t been kind to Del Toro, what with his involvement in two major films curtailed for various reasons. First off his directing gig on The Hobbit came to nothing when production delays caused him to leave the project. His next proposed movie, a big screen adaption of H.P Lovecraft’s Elder Gods horror At The Mountains Of Madness, was ditched by Universal due to concerns over its budget. When Del Toro announced that his next film would feature giant robots and monsters I couldn’t help but feel that he’d gone from the sublime to the ridiculous, that he’d jumped at the first movie that came along more out of a need to have a hit and to have something to do. Boy, was I wrong. The plot to Pacific Rim will be familiar to even the most casual fans of Godzilla and Japanese monster movies. Humanity is on the brink of extinction due to continuing attacks by giant monsters, or Kaijus, who travel to Earth through an inter-demensional portal that has appeared under the Pacific Ocean. Humanity’s answer to the onslaught are Jaegers, giant robots that are controlled by two pilots who must share a mind-meld in order to successfully command the machines. The film centres on the pilots of the Jaeger Gipsy Danger played by Charlie Hunnam and Rinko Kikuchi, both of whom have their own reasons for seeking revenge against the invading creatures. Charlie Day and Burn Gorman provide comic relief as scientists who attempt to communicate with the Kaijus, while Idris Elba commands the team in a role reminiscent of Bill Pullman’s in Independence Day; Elba’s finale speech (“Today we are cancelling the apocalypse!”) bears more than just a passing resemblance to Pullman’s rousing speech from ID4. Throw in a plot that involves an attempt to close the dimension rift while simultaneously fighting off a horde of the monsters and you have the film in a nut-shell. The plot may not be the densest every committed to celluloid and character development could be stronger, but who cares? The action set pieces are breathtaking and well mounted with several cities, including Sydney and Hong Kong, being flattened in the process. And the film just rattles along with a sense of fun and exuberance that’s sadly missing from many of this summers big movies. That’s not to say the film is all spectacle – there are plenty of nice Del Toro touches, such as the air-tight insect-like suits worn by black market scavengers, as well as the Hong Kong district nestled inside the giant rib cage of a fallen monster. Pacific Rim may not be the most cerebral movie of the year but it doesn’t make the cardinal sin of taking itself too seriously; the film promises giant robots and monsters whaling on each other and delivers in 500-foot tall spades, having a tremendous amount of fun in the process.